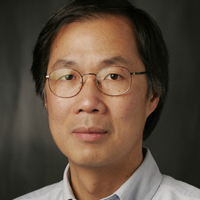 Leong's research interest focuses on biomaterials design, particularly on synthesis of nanoparticles for DNA-based therapeutics, and nanostructured biomaterials for regenerative medicine. Ho, Y. P. and Leong, K. W., Quantum dot-based theranostics, Nanoscale, vol. 2 no. 1 (2010), pp. 60-68 [PDF] [abs]. Yim, E. K. F. and Darling, E. M. and Kulangara, K. and Guilak, F. and Leong, K. W., Nanotopography-induced changes in focal adhesions, cytoskeletal organization, and mechanical properties of human mesenchymal stem cells, Biomaterials, vol. 31 no. 6 (2010), pp. 1299-1306 [PDF] [abs]. Chen, S. and Jones, J. A. and Xu, Y. and Low, H. Y. and Anderson, J. M. and Leong, K. W., Characterization of topographical effects on macrophage behavior in a foreign body response model, Biomaterials, vol. 31 no. 13 (2010), pp. 3479-91 [PDF] [abs]. Chen, H. H. and Ho, Y. P. and Jiang, X. and Mao, H. Q. and Wang, T. H. and Leong, K. W., Simultaneous non-invasive analysis of DNA condensation and stability by two-step QD-FRET, Nano Today, vol. 4 no. 2 (2009), pp. 125-134 [PDF] [abs]. Oney, S. and Lam, R. T. S. and Bompiani, K. M. and Blake, C. M. and Quick, G. and Heidel, J. D. and Liu, J. Y. C. and Mack, B. C. and Davis, M. E. and Leong, K. W. and Sullenger, B. A., Development of universal antidotes to control aptamer activity, Nature Medicine, vol. 15 no. 10 (2009), pp. 1224-1228 [PDF] [abs].